"Once when travelling across the Nevada's lonliest highway, aka, Hwy 50 in Nevada between Fallon and Ely, I chanced upon some cowboys herding a few cows. It was a beautiful mild day with no wind (for a change) so I stopped to watch them and take a few pictures. It's desert country which is in part of an area known as the "Great Basin" and the feed here is sparse. It sometimes takes days to cross a single ranch so these boys spend a lot of time in the saddle. 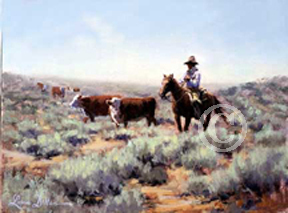 This painting is a tribute of sorts to those Great Basin cowhands."